Kingdom of Persis. Artaxerxes II, 1st century BC. Silver obol. Kingdom of Persis. 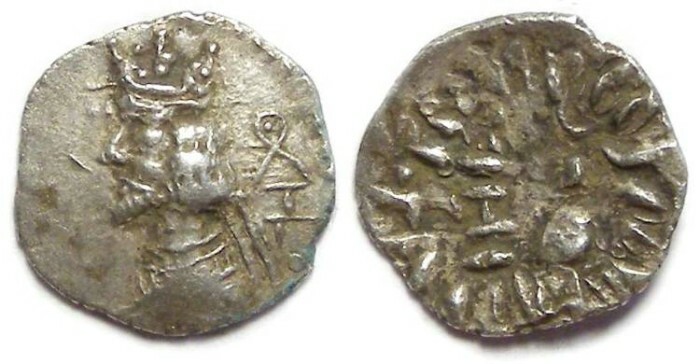 Artaxerxes II was also known as Ardashir II. The kingdom of Persis was the last outpost of the old Persian Empire, which survived the conquest of Alexander the Great, and later re-established itself as the Sassanids. Size : 11.3 x 12.0 mm. Weight : 0.62 grams. Obverse : Crowned bust of Artaxerxes left. Reverse : The King standing left before a fire altar, with inscriptions around.